Distinctive Concrete of New England recommends resealing every 2 or 3 years. If you wait longer, you may notice the color fade slightly. 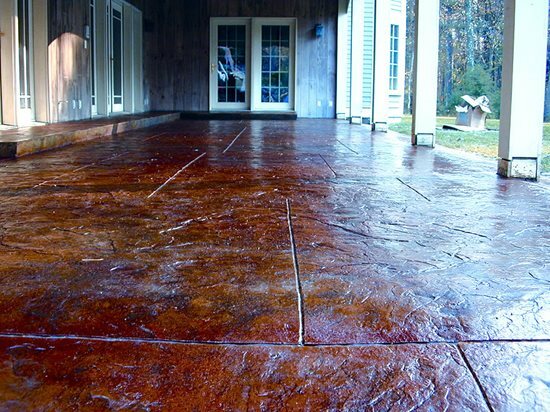 But just like waxing a car, reseal your stamped concrete and the color will be as vibrant as the day it was installed. 1. Rinse dirt/debris off stamped concrete surface with a garden hose or pressure washer. 2. Apply a small amount of liquid dish soap to surface and scrub with a push broom. 3. Rinse well with a garden hose or pressure washer until there is no sign of soapsuds. 4. DRY surface completely with a leaf blower or wait 24 hours to air dry. DO NOT APPLY SEALER TO A DAMP/WET SURFACE. Stir in one jar of Anti-Skid material to a 5-gallon pail of sealer. APPLY SEALER USING A 1" NAP ROLLER ONLY. ANTI SKID MATERIAL WILL NOT TRANSFER THROUGH A SPRAYER. Apply sealer in approximately 2' x 4' sections. This will ensure full coverage without missed spots. Keep stirring sealer while applying to keep the Anti-Skid suspended in the sealer. Sealer should be applied when air temperature is above 55 F. Best results will be obtained by applying sealer during cooler temperatures -- fall and spring -- or before 10 am and after 4 pm in summer months when surface temperatures should be under 90 F.
6. A second coat can be applied after the first coat is tack free (not sticky to your touch). 7. 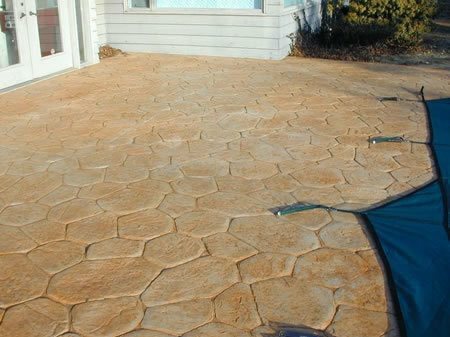 Your stamped concrete should be resealed every 2-3 years to protect your investment. One 5-gallon pail of sealer will cover approximately 1,000 sq.ft.